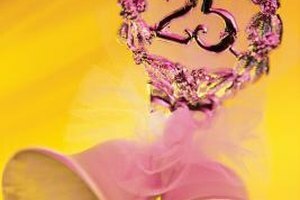 The 25th anniversary is also known as the silver anniversary. Twenty-five years of marriage is certainly worth celebrating. Many couples document this milestone with professional photography. There are different photography scenes and settings appropriate for the occasion. To prepare and plan for anniversary photography, reflect on this moment and on the years past. Use your experiences as inspiration for photography. The 25th wedding anniversary is associated with silver. To represent this theme in your anniversary photographs, incorporate silver in the pictures. For instance, wear silver clothing. Alternatively, wear accents, such as silver jewelry or a silver belt. Another option is to hold a pair of silver bells, which recall wedding bells. Gardens provide very romantic settings for couples photography. To commemorate your 25th wedding anniversary, have your picture taken in a local garden or park. Ideally, choose a place that has special meaning for you and your spouse. For instance, choose a local park in which you and your spouse love to take walks. Or, if you and your spouse spend time outdoors in a home garden, consider setting the scene in your own backyard. To celebrate your anniversary in a truly meaningful way, re-visit a special place for the photography. Have your picture taken at the church where you were married or at the scene of your engagement. Alternatively, re-visit the place where you and your spouse shared your first date. If you have moved far away and cannot re-visit past scenes, recreate a similar scene. For instance, if your first date was at an ice-cream parlor, use ice cream as the theme for anniversary photography. Professional photographers often recommend taking candid shots, as well as posed shots. A candid shot is one in which the subjects are oblivious to the camera. One idea for taking candid shots is to have the couple dance together. Place an anniversary or special song, such as the song to which you first danced at your wedding. As the music plays, engage with your spouse and ignore the camera. You may be surprised by what the candid shots capture, which posed shots cannot. After 25 years, many married couples have children, perhaps even grandchildren. There is no reason why family must be excluded from anniversary photography, especially because these loved ones are part of the celebration. Take photographs of you and your spouse individually, but also incorporate your family and loved ones in a few shots.